Signs By Van is the leading sign maker in Monterey County, and one of the reasons for that is our commitment to doing the sign process “above the board.” We do this by applying for city approval for all of our exterior signs and murals to ensure that there are no hiccups when we install your custom sign. Doing this saves everyone time and money, and makes sure that your business stays in line with city ordinances regarding signs. Why Do Cities Have Sign Regulations? Sign regulations fall into a category of zoning ordinances that regulate what buildings can be used for and what they can look like. Design regulations, while many find them restrictive, are actually in place to improve the overall aesthetic of a town. Signs are designed to attract customers, and without regulations, business owners would go to great (and obnoxious) lengths to get a customer’s attention. Over time, you can imagine that storefronts would become cluttered and overrun with signage. Additionally, sign regulations help to make certain areas look coordinated with similar materials and styles. But most importantly, sign regulations are in place mainly as a safety concern. They make sure that drivers won’t be blinded by bright, flashing signs, that they are constructed and installed safely so they don’t fall, and that the signs do not obstruct things like traffic signs. Regulations regarding signs will differ from city to city and even by location within the same town. Monterey County, for example, has an ordinance in place stating that commercial signs should not be more than 20 square feet. However, in Carmel, which is part of Monterey County, commercial signs should not exceed six square feet, which is significantly smaller. Monterey County also discusses the lighting of commercial signs in the ordinance. Specifically, lighting of a commercial sign must not “produce a glare on other properties in the vicinity,” and “the source of light shall not be visible from a public street.” We are known for our 3D designs on our sculpted wooden signs, but some townships may not allow 3-dimensional outdoor signs. Ultimately, approval for signs lays in the hands of the official decision makers of the city, and the process can be confusing. Especially when towns may have different regulations than the counties they are in. Some towns even have regulations about signs inside of your place of business. Carmel, in fact, has very strict regulations regarding interior signs, and a permit is required for most interior signs, including neon signs that may be visible from the street. For example, a custom banner inside of your Carmel store may need a permit if the letters are larger than one-inch in height, which includes almost any easy-to-read banner or sign. Most sign ordinances can be found on a town’s Chamber of Commerce website, but these can sometimes be outdated, and it is better to call or email your city officials directly for updated information. 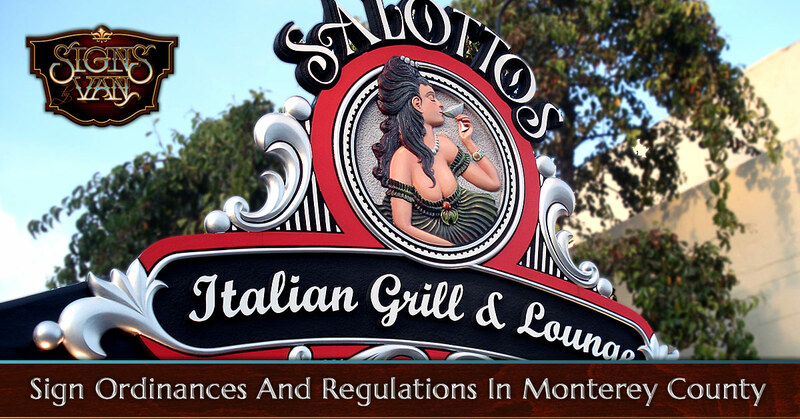 At Signs By Van, we are familiar with the zoning laws and sign regulations in Monterey and nearby towns. Part of our sign making services includes submitting designs for city approval, or even taking the design to the Architectural Review Committee if needed. As your full-service custom signage company, we really do take care of the entire process from design to installation. Learn more about our process here, and contact us today and let us know how Signs By Van can create the custom sign your business needs.